Concrete resurfacing is a more affordable alternative to removing and replacing a concrete slab. It involves the application of a thin layer of coating or overlay on an existing concrete surface. The new layer covers up minor damage, gives a new look to the concrete space, and extends the life of the slab underneath. Before resurfacing can be done, the old slab must first be prepared. This involves performing necessary repairs, washing, and air-drying. It is important to note that not all concrete can be resurfaced. Concrete with deep and extensive damage, for example, might be better off replaced. It is highly recommended to have a pro assess your concrete surface first. Stamped Concrete Overlay – A stampable overlay is often applied at about ⅛ to ¼ of an inch, depending on the type of pattern to be imprinted. After the overlay is laid out, stamp mats are laid out in pieces until the pattern is imprinted on the surface. The most popular patterns include flagstone, ashlar, brick, cobblestone, and more. Concrete stains are often added to make the pattern look more realistic ideal for any pool deck, driveway, and concrete patio resurfacing. Spray Knockdown Texture – This spray-down system involves an acrylic concrete coating that is sprayed onto a slab using a hopper gun. The bits and pieces splattered on the surface are then flattened a bit with a trowel. This process creates a textured surface that is similar to stucco but not as intense. A spray texture is known for resurfacing a concrete pool deck because of its high slip-resistance and cool temperature. Epoxy Flooring – Epoxy is a two-part material that is often used on garage floors by epoxy flooring contractors in Denver, Colorado. It is resistant to most types of damage, such as abrasion, chemical spills, and more. Although durable, this material is quite sensitive to UV rays and must only be used indoors to prevent discoloration. Polyurea Polyaspartic – Similar to epoxy, polyurea polyaspartic also consists of two parts. However, this is a fast-drying coating that hardens and cures within 24 hours. It is ideal for urgent projects and for commercial spaces that could not afford to close down for more than a day. Tired of Old and Damaged Concrete Surfaces? CALL (720) 545-1766 for Concrete Resurfacing. Denver Concrete Artisans is a leading decorative concrete company that has been in existence for over 20 years now. 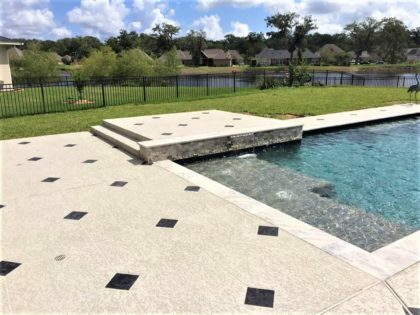 We specialize in decorative concrete resurfacing solutions for pool decks, patios, driveways, interior floors, commercial spaces, and more. We care about your needs and your wants and we make sure that every solution we offer is in accordance with your preferences and price point. Call us today for a free consultation and quote on your desired concrete resurfacing project.